If you are looking for additional income streams, you should consider opening a dropshipping store. And unlike what many people think, dropshipping is actually a low-cost way of starting a business with an unlimited earning potential. Dropshipping is a no-brainer as you do not need to purchase any products you are offering upfront. Simply get the customers to pay you, and then pay the supplier of the product you are promoting. Even better, if you do not want to get into the technical details of setting up a dropshipping online store, you can purchase one that’s already built and populated with products. The only thing remaining will be for you to promote the products, which you can do in multiple ways. The best pre-loaded dropship websites that I’ve come across are those by AliDropship. You may know or have heard about AliDropship plugin. This is a WordPress plugin by AliDropship.com that makes it easy to import AliExpress products into your WordPress ecommerce store. However, apart from the AliExpress plugin, AliDropship also offers custom-made stores to people who’d like to get started quickly and don’t want the hassle of doing the store setup by themselves. The company offers “turnkey dropshipping stores“. This is just a fancy way of saying that the company sells websites that are preloaded with products that you can start driving traffic to and make sales. These preloaded websites are designed to be high-converting and use premium themes that look good. If you have been thinking of starting a dropshipping business on the side but have limited time to put in, I recommend you get a custom store from AliDropship. These stores are also perfect for anyone that does not have prior knowledge on building or customizing ecommerce stores with WordPress. What I love about the AliDropship custom stores is that they are directly linked with AliExpress through the AliDropship plugin. Therefore, you can remove or add more products to your store in the future. You do not have to buy the AliDropship Custom Store. However, if you are not comfortable setting up your own ecommerce store with WordPress or do not have time to do the setup on your own, buying a preloaded dropshipping website will save you time and help you get started quickly. Here are some reasons why I feel buying an AliDropship custom store makes sense. A few of these reasons are bound to apply to your case. No matter your background or country, you can start your own dropshipping business with very little cost. You do not need to be a tech wizard as all the setup work will be done for you when you choose a custom dropshipping store. There are a number of ways in which you can get your own custom store. First off, you can buy an AliDropship turnkey custom dropshipping store. I would recommend you buy a custom created store if you do not have any technical experience or prior experience with making ecommerce websites. When you buy a custom store, AliDropship will handle all the technical details of the setup and deliver a fully-functioning store to you in just days. This means you will only have to start marketing the products that come preloaded in the store and start making money. If you know how to work with WordPress sites, you can install the AliDropship plugin by yourself. The plugin works like just any other WordPress plugin. However, setting up your store with the plugin takes some time. In particular, if you want to import a lot of products, the process can be quite time-consuming. I’ve found that customizing the store takes the most time. I mean, you have to add a logo, custom text, banners, and so on. If you can do all these on your own, it’s not a big deal. However, if you want to save time with doing these setup tasks, then getting a custom store from AliDropship would make sense. The AliDropship team will do all the technical setup for you, leaving you with time to start marketing the products from day one. One of the biggest challenges of dropshipping is determining what products to sell. You don’t just want to sell any products. Instead, you want those that are proven to be in demand and will turn you a nice profit. Selecting a niche can be quite time-consuming when you do it manually. If you wish, you can speed up the niche selection process using a tool like Ali Inspector. Of course, this will mean having to purchase the tool. For me, I’ve found out that the best products for dropshipping for beginners are those that have a low price point and encourage impulse buying. An AliDropship knows this too and this is why they create high converting online stores that will help you make money as soon as possible. Here is an example of a custom AliDropship store that is selling cat vanity gifts. You can see more examples of custom AliDropship stores here. There are many niches that you can tackle. Using Ali Inspector will make it easy for you to find profitable dropshipping niches. If you are stuck on finding a niche, let the AliDropship team do the hard work for you. Market research and niche selection are offered as part of your custom store order. The store you will get from the AliDropship team will be customized according to your wishes. When you order a store, a project manager will be assigned to help you all the way to when the store is delivered. The project manager will create your project on BaseCamp, where you can monitor what the team is doing or has reached with your store at any time. This means you can ask questions, leave comments or feedback as the store is being built. This kind of support is important as you want your store to be built according to your specifications. When your store is delivered, it will be ready to accept orders and payments from customers. Therefore, you can start promoting the store right away on Facebook or niche forums. The AliDropship custom store is powered by the AliDropship plugin. Therefore, you can fulfill orders automatically. Moreover, the plugin will automatically handle order tracking. AliDropship plugin has many features that make it easy for anyone to maintain their store efficiently. Another reason why I like AliDropship custom stores is that part of the marketing for the products in your store will be automated through a special plugin known as Social Rabbit. This plugin will automatically post your products and promote your business on Twitter, Instagram, and Pinterest. With the Ultimate custom store plan, you get automated store promotion. When the AliDropship custom store is delivered, it will be 100% yours. This means you can change it any way you’d like. One of the major reasons why I prefer dropshipping using WordPress rather than Shopify or other third-party platforms is that I can retain the ownership of my store. Shopify is a great company that has lost of features that make it easy for anyone to set up an online store. However, you do not fully own the store. Shopify can close your store for whatever reason. Moreover, you cannot move your store to another ecommerce hosting provider, perhaps to save on fees. In a nutshell, you are leasing the Shopify store and cannot fully own the platform. 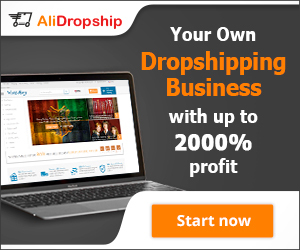 With AliDropshiping, you have 100% control of your store. You can move it to a different host, sell it, etc. Regardless of the custom store plan you choose from AliDropship, you will be able to import unlimited products using AliDropship plugin. For instance, if you go for the Basic package that comes with 50 pre-installed products, you can later import more products on your own. You may wonder why this point is a big one for me? Well, this is because there are other dropshipping plugins that charge a monthly fee for use. Some of the plugins also limit the number of products that you can import per month. With AliDropship, you can import unlimited products and there are no monthly fees to worry about. AliDropship custom stores also come with unlimited order fulfillment. This is also important as there are some automated order fulfillment plugins that limit the number of orders that are processed per month and also charge monthly fees. For me, the last thing I want in any service is to be locked up in recurring payments, no matter how small they may be as they usually end up becoming quite high when looked at cumulatively. When the custom store has been delivered, the only task you will have to do is to market the products. I recommend you go through the marketing section of the AliDropship blog. Finally, you will get free upgrades and support since your store is powered by AliDropship plugin. The developers are frequently adding new features to the plugin that make it more functional and even easier to use. The Add-ons page is another area you should check if you would like to expand the functionality of your store. Some add-ons are free while others come at a small fee. However, you won’t need any of the add-ons when getting started with dropshipping. Is the Price of AliDropship Custom Store Worth It? Cost is, of course, a major factor to consider when looking to start your dropshipping business. It is important to be sure of what you will be getting when you buy a custom store from AliDropship. So, what’s the difference in the packages? The main difference in the packages mainly relates to the number of products imported, turn-around-time, and marketing options. Here is a table showing the difference in the packages. The AliDropship team will carefully select and analyze a niche for you by using Google Trends and Google Adwords. You’ll be given a niche is in demand now, has stable long-term resilience, and has maximum potential for future growth. The team will also analyze the competition and provide you with an in-depth keyword analysis. AliDropship will carefully select all the items for your store and only add products that are in high demand from the most trusted AliExpress sellers. The products will not only give you a good margin, but also stay well below the prices of your competition. AliDropship team will buy you an attractive (.com) domain name that fits your niche and desired brand. The domain name will be search engine friendly, short and easy to remember. After purchasing the domain name for you, they will transfer it to your Godaddy account with full ownership rights. You’ll choose from a variety of professionally designed themes proven to generate high conversions. All the designs are highly responsive and look great in any browser or device. You store will have a unique and clean design. The team will create a custom logo, header images, icons, favicon, banners and everything you need to have a store you’ll be proud to put your name on! The team will import all your products into the store and your shopping cart will be 100% ready to accept payments. Your store will also include an all-in-one dashboard for your sales, orders, stats and activities. All these will help you manage your dropshipping store easily and effectively! Google uses mobile-friendliness as a ranking signal in search results and they reward websites that are fully optimized for mobile platforms. Your website will have a cutting-edge responsive design that adapts to the screen size of any device — whether desktop, tablet or mobile. Your store will have all the necessary features for creating and managing your product catalog. You’ll be able to easily import your AliExpress items. Moreover, the store will auto update product information and price changes in real time. You are the full owner of your dropshipping store and you’re free to do whatever you like with it. You can customize it … add or remove pages … edit content … sell the site … or even give it to a friend. Your online store will include all the tools you need to market your products, including discount coupons, product reviews, emails for abandoned carts recovery, and subscribers lists for further follow-ups. On-site optimization is about making your ecommerce website appeal to both shoppers and search engines. AliDropship search engine optimization services are designed to increase visibility within the algorithmic (“natural”, “organic”, or “free”) search results to deliver high quality, targeted traffic. Your store will be powered by AliDropship Plugin, which supports the most convenient and trusted payment methods such as PayPal, credit cards, 2Checkout, Stripe, PayU, etc. Video marketing is an extremely effective promotional tool. It helps to give your online store more trust, loyalty and search engine visibility. Your video will be tailored to promote your dropshipping store while explaining the distinct advantages of your products and services. Social Rabbit is the #1 WordPress plugin for auto-running and auto-promoting your online store on the most popular social networks. It ensures a constant flow of qualified traffic and has been proven to save our clients an average of 40 working hours per week. That means a big portion of your business will quite literally run on autopilot! Your ecommerce store will include creative and engaging pages on the most popular social networking platforms. Your graphics will be professionally crafted by our team of talented designers to give your store the boost it needs to come out the gate strong. How Do I Get a Custom AliDropship Store? If you are interested in getting an AliDropship custom store, you’ve made a good choice. I’ve bought two stores from AliDropship in the past and I’m quite happy with them. To begin, you should know that the stores are built from scratch. That is, when you order a custom store, the team will get to doing the niche research, buying the domain name, installing the themes, etc. All these activities can take anywhere between two to three weeks. Therefore, you have to be patient. When you order an AliDropship custom store, regardless of the package that you choose, you will be assigned a personal project manager to guide you through the entire process. The team at AliDropship uses BaseCamp project management software, which you will be invited to so that you can monitor the progress of your store. As the store is being built, you can leave feedback to be implemented by the developers. You will also be asked to fill in a questionnaire so that the project manager knows of any special requests or preferences about the store that you may have. For example, if you already have a logo and would like a specific branding to be adhered to, you can indicate so in the questionnaire. If you already have a niche in mind, the project manager will evaluate it and advise you on its potential. If you don’t have a niche, the team will do the market research for you to uncover a profitable niche. The niches are selected based on current trends, products that are in demand, SEO potential, and profitability. I find the niche selection an important service for anyone who is beginning dropshipping and does not know which niche to go for. The team will then handle all the technical aspects of installing and setting up the custom store for you. The store will be built on WordPress and will have the AliDropship plugin. The team will also set up Google Analytics, register your domain name, set up the payment gateways, set up the hosting, and more. There are three main themes you can choose from for your store. These themes have been designed to be mobile responsive, are visually attractive, and have the highest conversion rates. After choosing your theme, your custom graphics will be created. These include the logos, banners, favicons, and other images. The next step is importing the products to your store. Unlike some preloaded dropshipping sites that come with random products, the team at AliDropship actually research the products and import those with the highest demand and that will give you the most profit. The team will also set up the proper currency and markup formula for your product pricing so that you can make a profit from the first sales. The last step is marketing and promotion of your online store. Every product page added to your dropshipping store will be edited for the highest conversions. The pages will be optimized for SEO to attract organic traffic from Google. Finally, the team will create your store’s social media account pages and promote the products there. Verdict: Should You Buy AliDropship Custom Store? I will absolutely recommend you get a custom store built by AliDropship if any of the above apply to you. On the other hand, if you like to do things on your own and save money, you can set up a WordPress ecommerce site by following this guide. Buying a custom store will, however, save you time as you will get a read-made store that is ready to accept orders from the first day. Another thing I should mention is that the stores do not come with any recurring charges. Unlike is the case with Shopify, where you have to pay a monthly fee, AliDropship custom stores only cost a one-time fee. The only costs you will incur are those of renewing the domain and hosting, which will come after a year. The basic Shopify plan costs $29 a month. This means you will end up paying $348 a year for hosting. With AliDropship, the hosting is only $48 a year. And if you wish, you can use any hosting company you prefer.